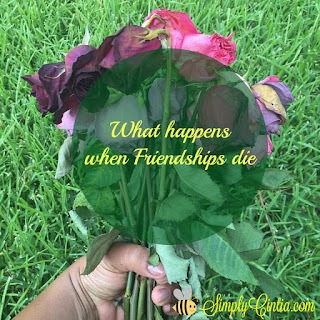 What happens when Friendships die? Well, someone writes the obituary. I'll jot a few things to help you get the idea. "Friendship "Friendy" Lost" - Sunrise, March 4, 1994 - Sunset, November 17, 1997. Resident of the heart. "Friendy" was born near the neighborhood park. She grew up surrounded by friends and enjoyed sunny afternoons drinking iced tea in the porch. Friendy enjoyed long conversations, taking silly selfies and trips to the mall. There will be no memorial service. In lieu of flowers, contributions to my understanding of why Friendy died is very much appreciated. It is difficult to understand why friendships die but I'll attempt to explain just why. The friendships made for movies last. Thelma and Louise. Forrest Gump and Bubba. The cast of Steel Magnolias. In real life tough, some friendships die. Some die of natural causes, others, we will never understand. The pain of a friendship loss is real and lasting. Closure is nearly impossible to get. 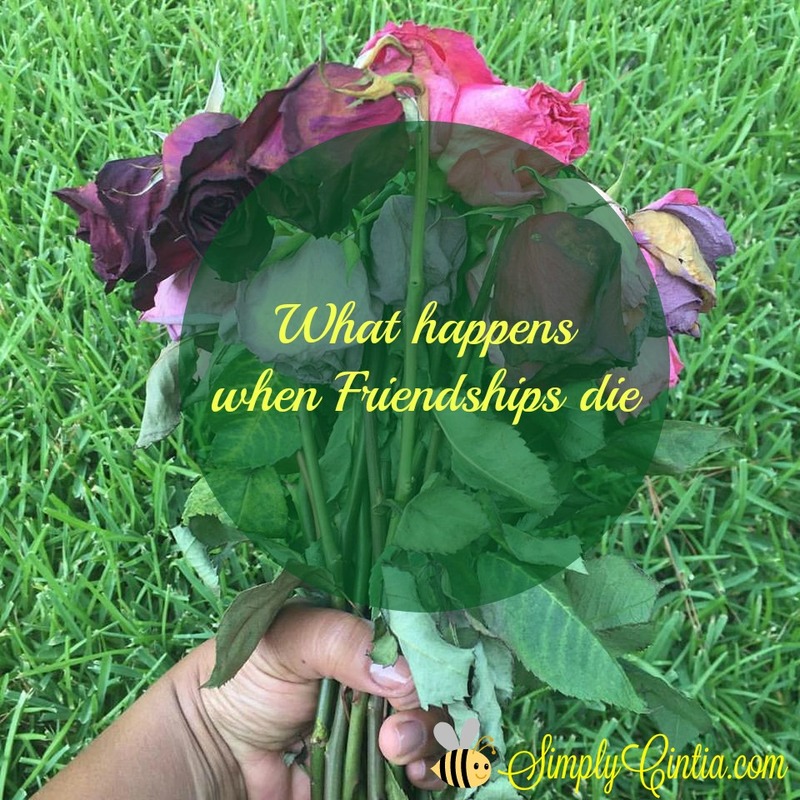 What happens when friendships die? They need to be buried. In the digital age, it's hard to do. When you think you're over it, Facebook memories remind you of what it used to be. "People you may know" brings back that familiar face that is gone for good. Some way, the friendship gets buried in the everyday flow of life. What happened when "Friendy" died was a void. That void was accompanied by a pain that still hurts to remember. I thought Friendy would thrive. I did all I could, I was a good friend after all! Now that I look back, Friendy did what her last name suggested: she got lost. She got lost in her own interests - where I was non-essential. She got lost in the new phase of her life - which I respect as I wasn't included. She just moved on without non-essential me. I hear that not every "Friendy" out there graciously leave. I heard that sometimes they scream "GET LOST!" and you leave with your head down in complete disbelief. I heard that sometimes, she becomes violent, crazy, intolerant or just plain mean. In those cases, we volunteer to get lost, but it still hurts. How can a friendship so promising turn out to be toxic? What happens when a friendship dies? We have to grieve and walk away. I say grieve because it's part of human nature. If people keep telling you to "get over it, she was a witch anyway," find someone like me who cares about your story. That pain inside comes out through healing tears. They need to be outed in a healthy way. When the grieving period is complete, we are ready to see that there's life after the death of a friendship. Friendy may be gone but I'm not. I'm still a good friend. I'm still generous, fun and kind. I'm a good friend and I believe there are good friends out there waiting for me. I can't let the death of a friendship paralyze me or inhibit me. I will find friendship again. When friendships die, we sometimes compare every friend material that walks into our lives to Friendy. I'm begging you, don't fall on that trap. Face new people with all the goodness that's inside of you, hold nothing back. What if that friend material proves worse? Give all your goodness, anyway. When you give what's best inside, you do exactly what God made you to do on earth. Remember that He didn't make friendship to be given for selfish reasons but He invented friendships to be generous agencies of sisterly love. What if the friend material proves to be better than you dreamed of? We will just have to find out right? New friendships are all about that delicious road of discovery. Don't let the hurt of the past determine what you will do today. Be healed from that hurt and give all the goodness stored inside of your generous heart. When friendships die, they somehow prepare the soil of your heart to receive God's best. He saw what happened cause He was right there beside you. I bet He cried too. That awful experience served as fertilizer. I know it stinks but beautiful fruit will come out of it. That's my daily hope anyway. God specializes in transformations. He can transform your broken heart into a whole heart again. Allow Him to be part of that healing process. Allow some of His children to hear your stories, cry with you and walk with you to a new place to love again and dream again and feel what real friendship should be like, all over again.